Liberal Democrat Maria Cantwell (D-WA) is wanting to block a mining project in Alaska because it might possibly affect the salmon population in Washington. MINE: Washington’s Cantwell fears for salmon; Alaska’s Young sees jobs. WASHINGTON — In a high-stakes battle that pits gold and copper against fish, members of Congress are scrapping over a plan to build one of the world’s largest open pit mines in southwest Alaska. Fearing that toxic wastes from the mine could hurt the wild salmon population in her home state, Washington Democratic Sen. Maria Cantwell intends to enter the fray today. 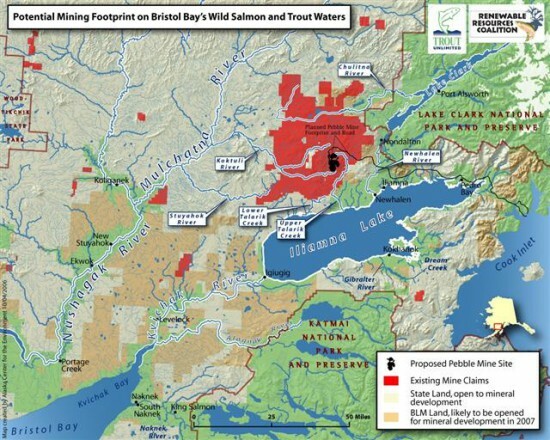 She plans to ask the head of the Environmental Protection Agency to consider using the Clean Water Act — if necessary — to stop the proposed Pebble Mine project in the headwaters of Bristol Bay. Cantwell, a second-term senator and a member of the Senate Energy and Natural Resources Committee, will become the first senator to issue such a call. She’ll face opposition from Alaska Republican Rep. Don Young, who already has introduced a bill that would strip the EPA of its authority to halt the project. The Pebble Mine, which is not even proposed yet, will require permits from at least 67 state and federal agencies according to the site owners, yet Sen. Cantwell wants the project spiked before any environmental review is even done.